Making dinner can be a chore instead of a labor of love when your family members can’t agree on what they want. 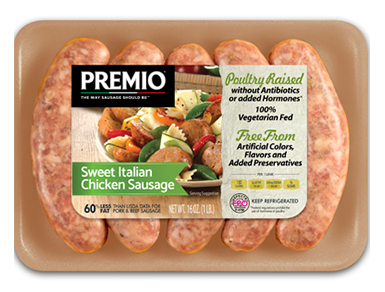 Those days will be behind you when you serve Premio Sweet Italian Chicken Sausage. Flavorful enough to enjoy alone and mild enough to incorporate into your family’s favorite dishes, Premio ABF Sweet Italian Chicken Sausage will become a staple in your fridge and on your table. Order some now! It’s tender, it’s juicy and it’s a best-selling Premio Foods product. It’s ABF sweet Italian chicken sausage, and you’re going to love every bite. We make our ABF healthy sweet Italian chicken sausage exactly the way you would if you created it from scratch. Zero fillers, all flavor. You’ve never tasted chicken sausage like this, and you’ll be hooked on the sweet flavorings thanks to our super-secret blend of Italian inspired spices. Think sausage has to be loaded with calories or fat? Think again. Our ABF sweet Italian flavored chicken sausage is loaded up with all the good stuff you want and not loaded down with unwanted ingredients. You can taste just how delicious natural is when you put your trust in Premio Foods and our line of sausage products. For several generations, we’ve focused on offering premium products you’ll want to give to friends and family members. Taste why we say we’re The Way Sausage Should Be™. Why stick with tried-and-true recipes when you can add fun and deliciousness with a touch of sweet Italian chicken sausage? You’ll be able to liven up favorites from omelets in the morning to stews at night. Don’t forget it’s easy to whip up a sandwich featuring our one-of-a-kind chicken sausage flavors. Try chicken sausage as an alternative to beef, pork, seafood and other meats and proteins. You might be surprised how a touch of chicken sausage completely transforms a meal from so-so to super. Be creative in the kitchen. Even salads love to be topped with grilled or sautéed Italian flavored chicken sausage. New to chicken sausage? We invite you to try all our flavors, including Italian style. You might just change the way you think about and use sausage on a regular basis. Plus, you’ll be happy at how cost-effective it is to feed a small or large group with our chicken sausage options.